The Institute of Cetacean Research, sounds like a benign pro-whale-protection research outfit, but the inapt name is that of the Japanese whalers. Now all that the toxic emitting oil refineries have to do is call themselves, Air Quality Analysers. Commercial whaling was banned in 1986 by the International Whaling Commission(IWC) based on anti-whaling movement growth in the 1970's and following a United Nations proposal recommending a ten-year moratorium on commercial whaling. Spurred by the Convention on International Trade in Endangered Species (CITES) investigations in the late 70's revealing the decimation of whale species to the point of near-extinction. As far back as 1925, The League of Nations, highlighted the concern of rapidly-depleting whale stocks. The Geneva Convention for the Regulation of Whaling was adopted in 1934, but as the early trend show, undeterred to date, is that the pro-whaling dissenters continued without concern for over-whaling. The problem is that IWC is not a legally-enforceable body, albeit the organisation was created in the 1940s as a pro-whaling 'regulatory' structure. The IWC has since grown to protect whale stock but has no real clout with all membership being voluntary. The prowhalers, Norway, Iceland, Faroe Islands and Greenland in resistance to the IWC's general whale protection standards, set up a body in 1992, the North Atlantic Marine Mammal Commission (NAMMCO). Another pro-whaling body is the Japanese funded World Council of Whalers based in Canada. 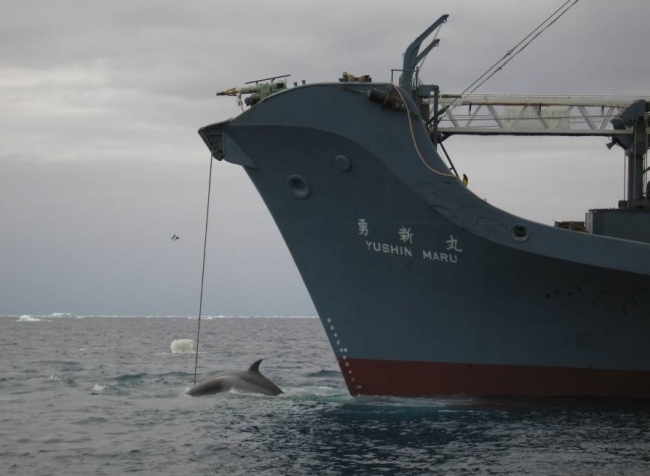 Japan is strategically manipulating a grey legal area in the whaling convention which allows for research catches. Japan then set up a whaling front under the guise of 'cetacean research'. Of course this allows them to designate all so-called non-useful research such as whale organs, blubber and meat for sale on the commercial food market. It's as if whaling was never really banned merely disguised in the form of research. A year after the ban came into effect, Japan submitted a 'whale research' proposal to the IWC claiming to require whale species for scientific purposes at a rate of 825 minke whales and 50 sperm whales annually, the IWC rejected the proposal as suspect. Current 'research kills' stand at over 1200 whales per year. If this was truly whale research, there would be no reason to kill whales, legitimate cetacean research institutions tag and monitor whales all the time. The Institute for Cetacean Research is just a name and operation cover-up for continued commercial whaling past the 1986-ban. All in the name of so-called research, over 15000 whales were massacred since the two-and-half-decade ban. 1994 IWC declared the Antarctic waters as a whale sanctuary, but the seasonal 'research' massacres continue. Japan is also keen on targeting humpback whales for 'research'. Exactly a year ago, the dedicated opposition tactics of the anti-whaling Sea Shepherd vessel, managed to halt the Japanese whalers from their seasonal Antarctica whale hunt. Early 2011 efforts from the Sea Shepherd and repeat efforts in 2012 put a halt to the seasonal Antarctic hunt. Nonetheless the hunters acquired 170 whales out of a 850 minke whale target. The whale killers are adamant that no amount of anti-whaling tactics will stop them entirely and while their hunts in the Antarctica were disrupted they will continue. Minke whales feature highest on the target species at a rate of 340, with the Sperm Whales (10) and Bryde's Whales (50). Other target whale species include Humpback, Blue, Fin, Sei, Pilot whales, etc. According to the work of the Australian Antarctic Division (2012), over 1.3 million whales have been taken from Antarctic waters this century, blue whales were once abundant with a population estimated at greater than 225 000, with whaling this is down to 2000. While Japan whale hunts under the research veil, other hunters such as Norway and Iceland are more direct and open. Japan is the leader in whaling and boasts a slaughter-tally of over 6000 whales since the 1986 whaling ban. 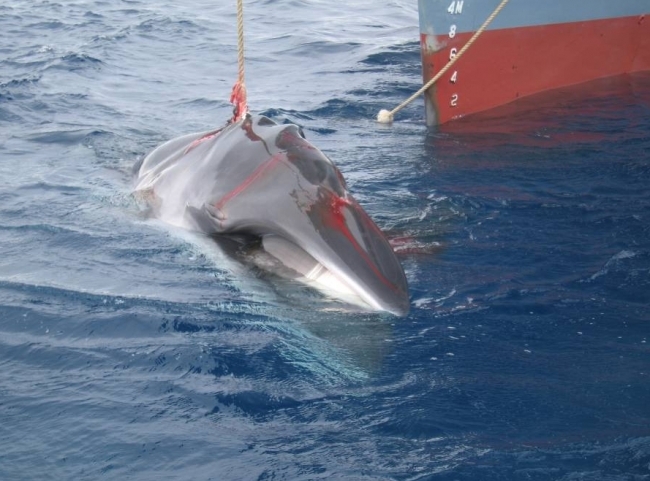 After the IWC rejected their research proposal in 1987, Japan sailed out to the Antarctica and killed over 273 minke whales. In November last year, in the Faroe Islands (a sovereign group of islands in the Norwegian Sea-North Atlantic Ocean is member of the pro-whalers) engaged in the massacre of 81 pilot whales hacking them to death in a blood-red seawater. A barbaric act extending to the killing of whale babies and mothers. 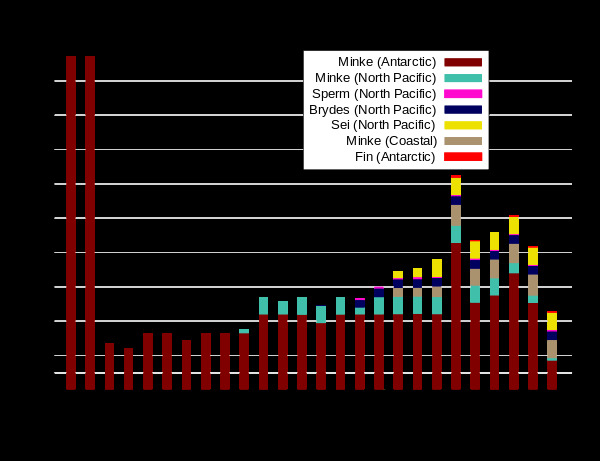 Norway has and still is engaging in whaling at a commercial level since 1994. Norway's quotas were up to 1286 minke whales in 2010. Iceland withdrew from the IWC in 1992, and like Japan and Norway flagrantly ignored the ban. The harpooning Icelanders have their goals set on a minke kill of 100 and 150 endangered fin whales. The Icelandic government allowed a five year quota system until 2014 of 100 minke whales and 150 fin whales. Other whalers include Denmark and island states in the Caribbean and Pacific Ocean. The Sea Shepherd Conservation Society has dedicated itself to the fight for whale protection. According to the Sea Shepherd (2012) hard resistance tactics they have succeeded in ramming and disabling the notorious pirate whaler, the Sierra; shutting down half of the Spanish whaling fleet; scuttling half of the Icelandic whaling fleet and whale processing station; scuttling of the Norwegian whaling vessels Nybraena and Senet confronting and opposing Japan's illegal whaling in Antarctica; ended the careers of 9 illegal whaling vessels, saving thousands of whales. In the case of the two Japanese whale protection activists, Junichi Sato and Toru Suzuki, whom have worked relentlessly on the campaign to expose the Japanese whaling industry and it's 'research' endeavours. Both activists have endured torture while incarcerated in 2008 and undergoing grave criminal justice violations. Tireless research by the two exposed huge corruption in the whale 'research' industry with whale products being embezzled. One would think any just government would reward such citizen contributions to exposing corruption, but instead the two dedicated activists at risk to life and freedom, were convicted and sentenced to one year suspended sentence in 2010. The committed research by Junichi and Toru, did however raise the awareness of the Japanese public, who were otherwise largely oblivious to how their tax contributions were funding a whale slaughtering operation built on profit and scrupulousness. Greenpeace have continued on a relentless campaign to secure the conservation sanctuaries and push for an outright ban on whaling. Amongst the nations promoting whale protection is the United States, United Kingdom, Australia and New Zealand. A strong anti-whaling lobbying sector has been the Latin American countries, proposing a declared whale sanctuary in their South Atlantic Waters in 2011. The proposal was derailed by the pro-whalers and we have yet to see whether the 2012 IWC meeting. The UK also came in strongly with its whale welfare recommendations regarding the cruel methods used, but these were also blocked by the pro-whaling nations. 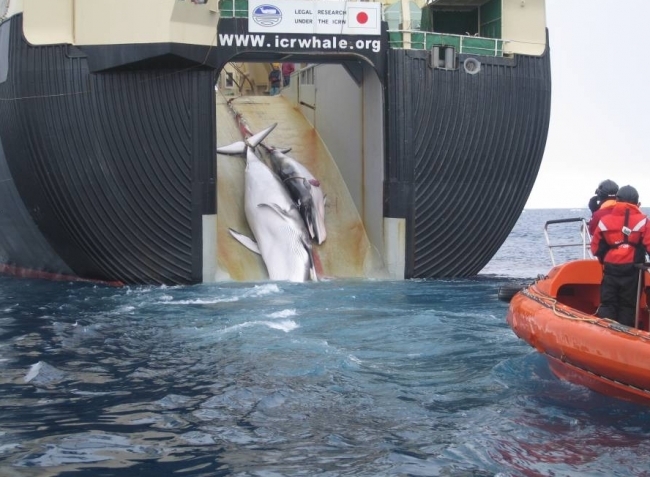 The Australian government has come out strong against the whalers, issuing a ban on the Japanese. What the IWC should be doing is placing a full ban on insidious research and fronting of commercial whaling together with a complete ban on harmful, cruel, slaughtering under the guise of research. Studying and researching all species has for decades been conducted by conservation authorities and academics in a innocuous manner. All IWC members should be enforcing ant-whaling laws tied into both the IWC agreements, CITES and further local conditions and standards. While the Sea Shepherd draws a distinction on its stance on aboriginal whaling versus illegal whaling and states "The hunting of endangered bowheads by Northern aboriginal people is legal according to the International Whaling Commission. Therefore, there has been no opposition to these practices by Sea Shepherd Conservation Society. The killing of bowheads by the Inuit in Canada is illegal because it does not have approval from the IWC. We oppose this hunt (Sea Shepherd,2012)." Shouldn't there be an outright ban on all whaling based on the pure and simple principle that our fellow intelligent mammals should not be killed by anyone regardless of traditional practices? Surely alternative sustainable non-slaughtering food sources where life-forms are not brutally tortured and murdered should be opted for.